The University of Memphis put on a full-court press — including a meeting with school president Dr. Shirley Raines — in an attempt to secure the services of Nina Davis. But ultimately an offer from the defending national champions was just too good to turn down. Davis, the two-time Pepsi Best of the Preps player of the year from Central, verbally committed to Baylor Tuesday afternoon, choosing the Bears over the Tigers and Vanderbilt. She will make her choice official during the early signing period, which begins Nov. 14. “Everybody thinks I picked Baylor just because they won the national championship,” said Davis, a 6-1 wing who is ranked 52nd in the nation according to ESPN Hoopgurlz. As excited as she is to be a Baylor Bear, the decision was also a gut-wrenching one for Davis. She’s good friends with current Tiger guard and former Arlington star Ariel Hearn and Lady Warriors coach Niki Bray said the U of M was hoping to make Davis the face of its program as it moves into Big East Conference play after this season. Davis said she didn’t come to her final decision until early Tuesday morning and then had to call and break the news to U of M head coach Melissa McFerrin. Despite her national profile, Davis said she still has doubters and she aims to prove them wrong at the next level. And they’ll be getting a player who’s even better off the court than she is on, according to Bray. Davis, who averaged 19.4 points, 9.0 rebounds and 2.6 assists per game for the Lady Warriors last season, is the second high-profile Memphian to commit to Baylor in the last week, joining White Station class of 2014 standout LeRon Black. Vanderbilt: Take a quick look at a Vanderbilt women's basketball conditioning session as they get closer and closer to the season. Vanderbilt: Trio of former Vanderbilt players set to meet in opener of Romania's Division A, with another to play in German Bundesliga. The environment surrounding recruiting is continually influenced by many different entities, each having their own agenda. The NCAA has an impact through legislation, knee jerk reactions and vision…or sometimes a lack thereof. College coaches can alter the landscape through their methods, ethics and style. It’s difficult for athletes, their families and coaches to effect change as most pass through the process once and move on. However, there are situations where recruiting decisions on their end results in changing recruiting trends. Three separate conversations in the past week convinced me to set aside another topic I was writing on and address a theme that seemingly needs attention time and again. The topic du jour is “offers”. Let’s get the simplest aspect out of the way first, that being the role that a scholarship offer plays in an athlete’s decision. It’s a given that, unless she’s planning on walking on, there has to be an offer on the table for a recruited prospect to choose a particular school. That part is obvious, but it’s not in the “decision” aspect of the process where offers are creating some unnecessary detours and speed bumps. It’s the role they play in the “recruiting” part of the process that leads prospects and programs alike to rush, alter and even compromise their approach. San Diego: A women's basketball blog by Brittany Conger. Texas: Texas will make a national appearance on FSN at least five times during the upcoming season. 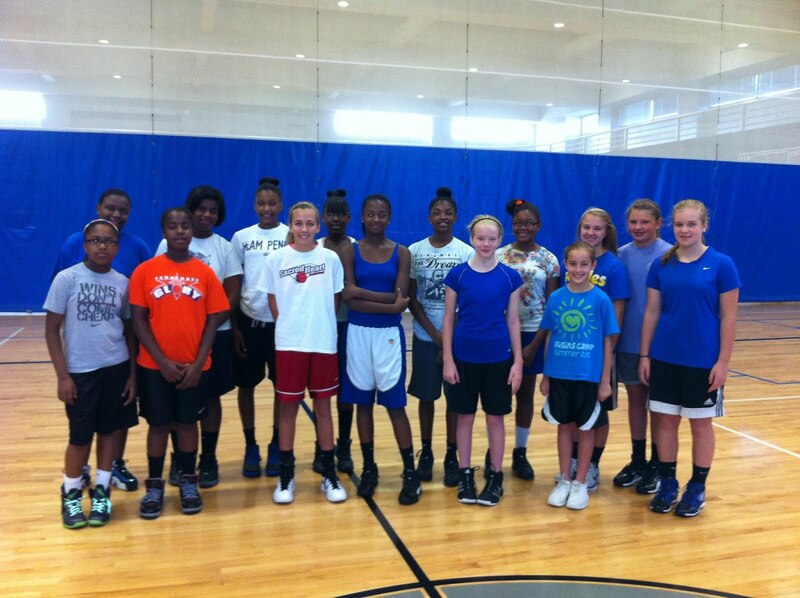 Received an email from forward Cheridan Burroughs' (Houston/Memphis Lady Bobcats-Harris) AAU Coach, Dexter Harris. Cheridan has drawn interest from Chicago State, Northwestern State and North Alabama. Received an email from guard Aysha Harris' (Houston/Memphis Lady Bobcats-Harris) AAU Coach and Father, Dexter Harris. Aysha has drawn interest from Kennesaw State, North Alabama, UT Martin, Cincinnati, UT Chatt, Southern Miss, George Mason and Norfolk State University and making plans to visit 3 schools next month. PeachStateBasketball.com recently released their recap of their July event, Real Deal in the ‘Ville. This is what they had to say about St. Mary's sophomore Kaylan Pugh. One of the quickest combo guards that we saw at this event was 5-9 Kaylan Pugh. She is equipped with crafty handles and the ability to get to the rim with her explosive first step. Pugh has the ability to run the show from the point guard position, but is more effective off the ball where she attack from the extended elbow. Pugh is definitely one to watch in the near future. Received a text from point guard Marisa Knox (Center Hill/Memphis Bobcats-Harris). The following schools are showing interest in her: Auburn, Austin Peay, Brown, Colgate, Illinois State, Kansas, Lehigh, Memphis, Mount St. Mary, Southeast Missouri State, Southern Illinois, Southern Miss, Stanford, and Vanderbilt. The 2012 Fall Exposure League kicked off on Saturday. The talent level in Memphis and the surrounding area is extremely good. This year's event offer a variety of talent and players representing public schools, private schools, home schooled, Tennessee, Mississippi, Arkansas and Alabama. It is a great event for young and old girls basketball fans to see. It says alot about a parent and player to travel over 3 hours to participate in a basketball event weekly. Camillia Carter, a senior shooting guard from Hueytown, AL, is on a mission to get her name out, display her talent and secure an athletic scholarship in basketball. She is a member of the Alabama Twisters summer program and academically has made an ACT score of 19. During her week 1 game, she showed her ability to be a very aggressive on the ball defender and a guard with 3 point shooting range. I was very impressed with Marisa Knox's (2014/Center Hill) performance on Saturday morning. There was just something different about her demeanor. She played with much energy and aggressiveness. She is definitely a pure point guard-always looking up the court to get the ball to an open teammate and looking to pass in the half court set. She doesn't look to score much but she likes the elbow shot and penetrates to the basket with intent. Certain body types just stick out on the court and Ineashia Claybrook (2014) and Amber Braxton (2014) has the body type. Both are extremely slim with extremely long arms. Ineashia Claybrook is from Gates, TN and plays the guard position for Halls High. Today she showed her energy, ability to slash and get to the basket for buckets. Amber Braxton at 6'0 has a very mild demeanor on and off the court. But don't let it fool you. On the court, she will score on the perimeter and in the paint. After watching Week 1 games, It was decided that there was too much talent in the building to not record it. So from this point forward, the league games will be recorded. The recordings will be used for evaluation purposes. Also, a game of the week will be selected to watch on MemphisGirlsBasketball.com or GirlsBasketballExposure.com. Indiana: An inside look at the family atmosphere within Indiana women's basketball. Received an email from Janeka Williams' (East /Memphis Tri-State Elite) AAU Coach, Fred Echols, She visit University of Texas-Arlington this weekend and next week she will visit UAB. UNLV: Nevada native Kalee Whipple joins UNLV coaching staff. Received an email from Aliyah Miller's (Southaven/Memphis Elite) AAU coach, Eric Daniels, she is visiting Providence this weekend officially. Received an email from Tiara Caldwell's (Millington/Memphis Elite) AAU coach, Eric Daniels, she is visiting UT Martin this weekend officially. Here is an article from the Memphis CommercialAppeal.com released on September 9, 2012. This article is primarily geared towards mens basketball recruiting so I’ve made notes in red to give you the womens basketball version. I believe it has some very useful information about how recruiting is transitioning because of technology. There was a time when a Division I basketball coach’s dropping into a prospect’s living room was a big, formal event. Back then, in-home visits were part occasion and part presentation, and they almost certainly left an imprint on the prospect and family. Nowadays, visiting a prospect at home is much less profound and can be one of the more campy components of recruiting, from University of Memphis coach Josh Pastner’s point of view, especially if the house guests have been courting the prospect for any length of time. Brian Tate is disappointed that he's not able to watch his son Kylan suit up for the Central High football team this fall because of Memphis City Schools' 2.0 rule. But he does think the right message is being sent. "It's been a good lesson," he said. "His mom and I stress academics ... he's accepted it and now his focus is on improving his grades. He's an athlete and he plans to try out for the basketball team. "They've taken the pass/play rule and they've upped the ante with it." Kylan Tate, a sophomore who was expected to challenge for the Warriors starting quarterback job according to his father, would have been eligible under the old rule, which stated players had to pass five classes. But under the new rule, which states that players have to have a 2.0 grade-point average in the previous semester in order to play, he wasn't. The rule became effective in March of this year and applies to all interscholastic activities. And while it's too early to assess the full impact of the rule, school board member Betty Mallott said the message, an increased focus on academics, is getting across to students and parents. "The purpose is to motivate the students to work harder academically," she said. "Too many young people involved in sports think that's their only avenue and they don't develop other aspects. "It's a shift in values. Even if it gives them an excuse to go home and study just so they can stay on the team (that's a positive.)" Received a phone call from Shunice Herron's (Bolivar) father, Jeff.--- Shunice committed to Tennessee Tech this past weekend. Received an email from KiKi Patterson's (Columbus(MS)/Memphis Elite) father, Mark.--KiKi committed to Mississippi State University on September 3, 2012. She had offers from the following: Lousiville, Maryland, South Carolina, Alabama, Southern Mississippi, Ole Miss, Auburn, Utah and others.